Last month I wrote about some of the personal benefits of volunteering — such as better emotional and physical health, a lower risk of cognitive impairment as you age, and a perception of having more time on your hands — as well as the positive impacts volunteering can have on your career. And last month’s Your AIChE Benefits article (Aug. 2017, p. 75) explained the concept of micro-volunteering — i.e., quick, easy tasks that do not require a large investment of time. 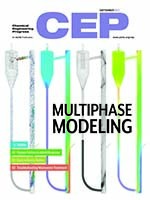 Coupling the traditional computational fluid dynamics (CFD) approach to model the fluid phase with the discrete element method (DEM) to model the particles creates a powerful numerical method to study multiphase particulate flows. This article describes several variables to consider when selecting a steam boiler — from choosing a boiler configuration to understanding boiler water chemistry. Use statistical analysis to find a cure for a “sick” wastewater treatment plant.